Time to spice up a dress shirt! An outfit without accessories is like a cupcake without frosting. So I set out on a mission. To show you four ways you could transform a dress shirt using a few small accessories. That's it. By adding a touch of bling and a bold lip you are instantly transforming this shirt into the perfect dressed up work look. Pair it with a pencil skirt, dress pants (maybe even in a fun color!) or a pair of fitted skinny jeans and you are good.to.go. Stylist tip: A white dress shirt is great to layer under a sweater or unbuttoned and tied over a dress. Don't limit yourself! Think outside the box. I like to think of my hair as an extra accessory. That's why I decided a side pony was the ONLY thing that could really compliment a Zack Morris pin. Kelly Kapowski inspires me til this day. Say what you will, but I own this part of my style hard. Fashion pins are all the rage these days and I have to say, I'm mildly obsessed. They are so quirky and fun that there is no WAY not to enjoy yourself while wearing them. Also, talk about a conversation piece! I used to be someone who overaccessorized. I wore lots of army parties, big necklaces, big earrings, you name it, I wore it. Now that I have young kids (one of whom is very 'grabby') I tend to choose smaller pieces. This necklace was a Mother's Day present and I wear it daily. Also, everyone should have a pair of small gold studs. These from Madewell are perfect because they are matte (which I like way more) and an octagon shape making them slightly unpredictable. If accessories make you nervous start small. The key word in that sentence is to START. Baby steps! To say I'm inspired by Kate Spade is an understatement. I live for their bold statement ads every year and think they are so fun and refreshing. This necktie from Zara can be tied in so many different ways. By pairing it with this dress shirt it REALLY stands out. I like to spice things up and wearing these big cocktail earrings with it made for a super fun, glamorous look. 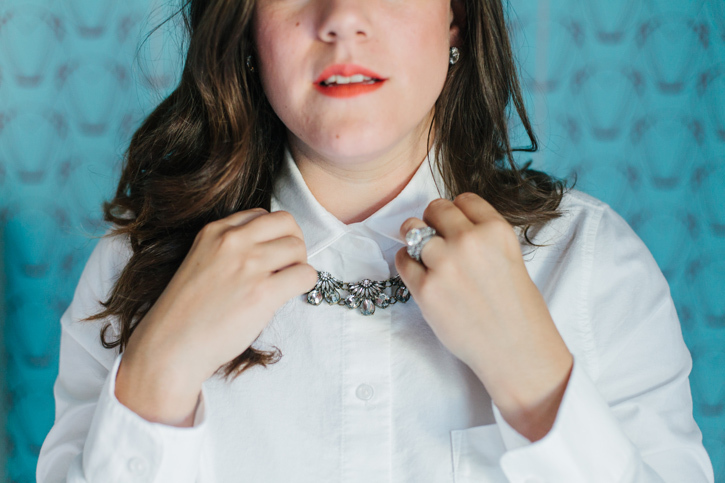 See, a white dress shirt collar can be glamorous too! So there you go, four different ways to change up a white dress shirt. Accessories are one of the most talked about things with my clients, and are mentioned several times in The Confident Closet. Figuring out what's too much, what's not enough... it can be overwhelming! Accessories are important and not only to make an outfit complete, but to tell the story of who you are. The Confident Closet is still open for enrollment and now is the time to jump on board! *** Tag me in your white dress shirts so I can see how you are styling them!